Standard Raman wavelengths include 532, 785, and 1064nm with many custom options such as 405, 633, 637, 648, 830nm! 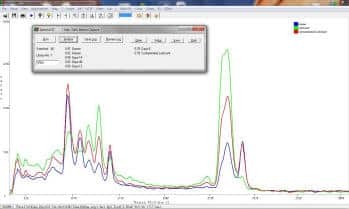 SpectraWiz ID Raman Library with Save and Search functionality included FREE. Save your samples and then search for matches! 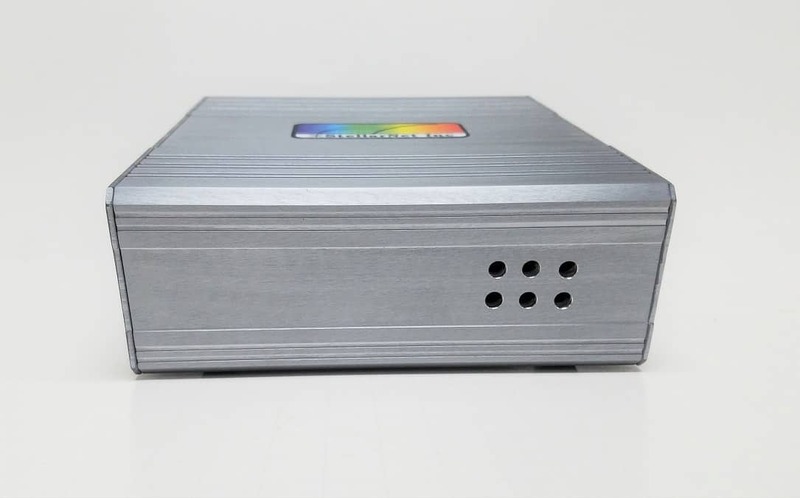 StellarNet has released a new series of updated spectrometers configured for Raman spectroscopy applications that perform quick identification of a variety of liquid, solid, or powder samples. 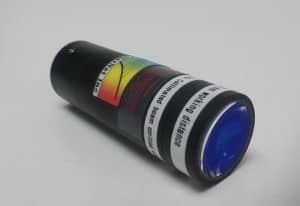 Raman-HR-TEC spectrometers include enhanced CCD array detectors for 785nm Raman & 532nm Raman with advanced detector lens assembly for ultra sensitivity at long exposure times. (other wavelengths available on request). Raman-HR-TEC-X2 offers 2-stage detector cooling for ultimate sensitivity and performance! 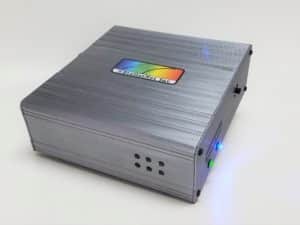 StellarNet Raman-HR-TEC-IG spectrometers includes a super cooled InGaAs photodiode arrays for 1064nm Raman where interference from sample fluorescence is minimized and virtually non-existent. 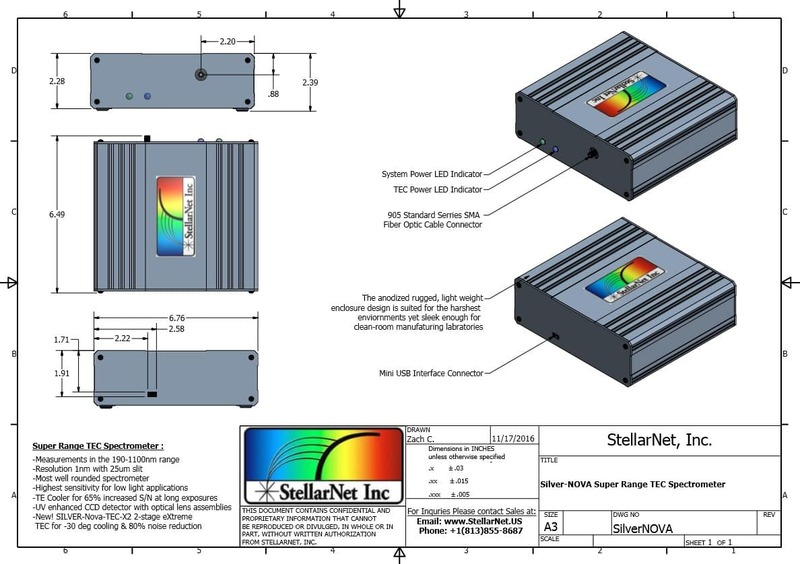 As always with StellarNet instrumentation, the fiber optically coupled Raman spectrometer series is extremely ruggedized and compact for portable and field applications. USB2 connection to PC for power and data is quick and easy!  Enhanced optics allow for extreme sensitivity and extra low stray light values down to 0.05%.  High Resolution models available down to 4 cm-1 with options for maintaining S/N with TEC cooling.  Compact size & seriously Rugged for portable and field applications. Metal enclosures are extremely durable. 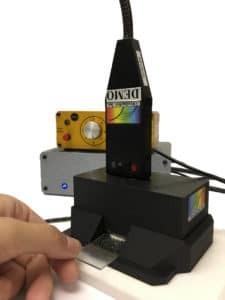 The new RPH5 is our new vertical Raman probe holder block that allows for measurement of samples on slides such as liquids, powders, films, and small solids. A set screw allows the user to adjust the height of the block to allow clearance for various samples. The RPH5 allows for direct measurement of samples without using a vial. This removes unwanted glass and container signal at long exposures. Also included with the RPH5 is a laser interlock system which will only allow the laser to fire while the probe is safely inserted into the probe holder. Includes a sturdy base so your samples wont tip. 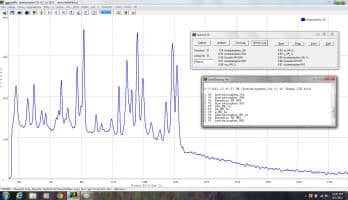 The RPH5 can easily be integrated into your existing StellarNet Raman systems that use a probe. 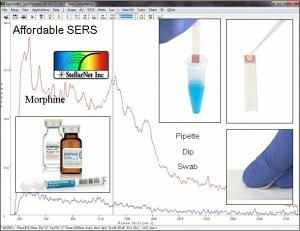 StellarNet has released new high performance & affordable Surface Enhanced Raman (SERS) substrates for use with their line of low cost Raman spectrometer systems. The SERS substrates intensify Raman emission through plasmonic resonance, boosting signal by many orders of magnitude & enabling detection levels as low as parts per trillion for certain samples. StellarNets SERS substrates have advantages over other technologies in low sample cost due to its unique nanostructure deposition process. Additionally, they offer flexible and quick sample application in the form of pipetting, dipping, or swab. There is no required sample drying and detection can be made in seconds! 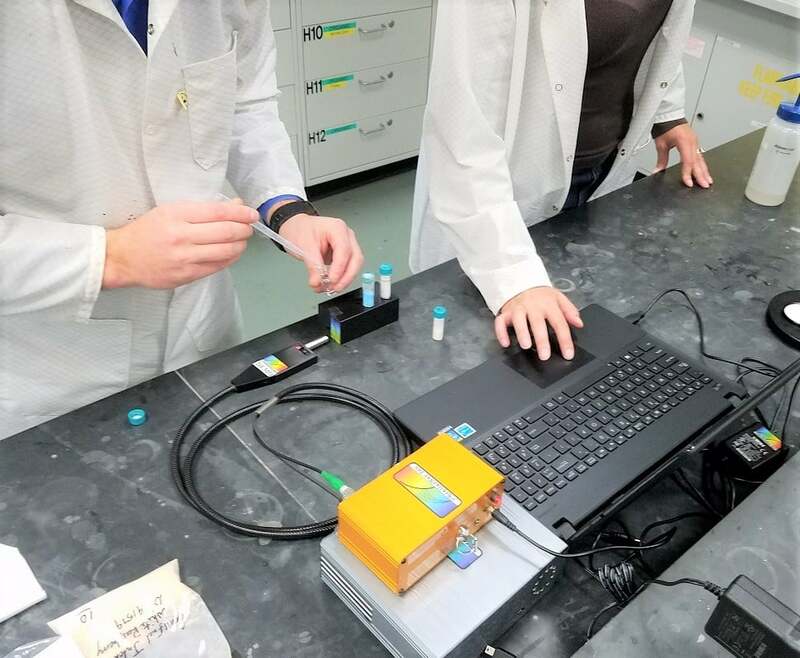 SERS is a natural fit for many trace detection applications, from detection of pesticide, explosive, and narcotics residues to applications including anti-counterfeiting, R&D and industrial process control. StellarNet SERS substrates can be used with all of our low cost portable Raman laser systems and similarly equipped microscopes. This add-on eXtreme cooler lowers the temperature of the CCD to 30 degrees below ambient and increases instrument S/N drastically by reducing noise over 80% at long exposures. 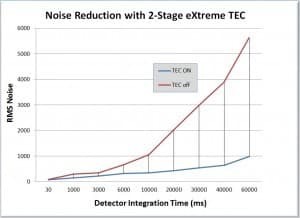 This 2-stage eXtreme TEC upgrade improves low light measurement quality and detection limit capability for Raman, Fluorescence, and other weak light emission applications. Thermoelectric detector cooling improves the stability of the detector for lengthy measurements where thermal noise can distort and drown signal. 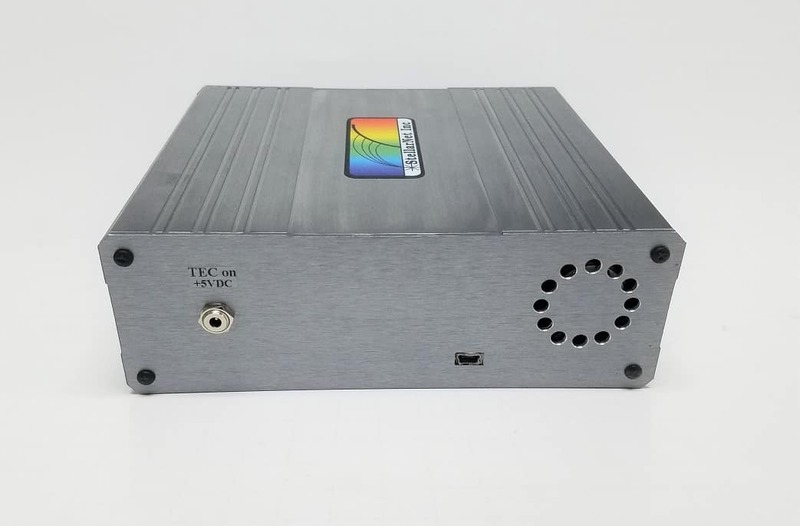 In order to achieve such low temperatures the 2-stage eXtreme TEC add-on includes a new sealed and isolated detector enclosure with specialized heat sink and air flow design for added stability and cool operation. 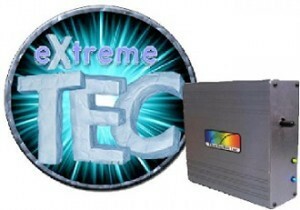 Add-on your eXtreme TEC today for just $2,950! Ask for a quotation or get in touch with your local StellarNet representative. Ramulaser-Vial Reduced cost with integrated probe! Raman Spectroscopy with a 785nm Raman Spectrometer and laser is our most popular option. Choose the Ramulaser-785, Raman-HR-TEC (or new Raman-HR-TEC-X2 upgrade), Raman-probe-785nm, Raman probe holder, and 785nm Laser Safety Goggles. For configuration options, see below. 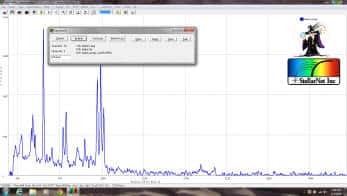 Pharmaceutical Match Raman-HR-TEC 785nm Raman spectra of Tylenol (Acetaminophen/Paracetamol) displaying Library search hit of Tylenol as #1 and Excedrin (containing Acetaminophen/Paracetamol) as #2.. 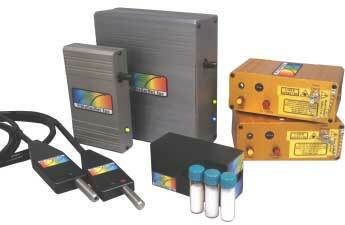 The Raman-HR-TEC Spectrometer is used to capture the Raman spectrum of a powdered Maltol sample in a 1/2? vial using the Ramulaser-785 & Raman-Probe-785. StellarNets free SpectraWiz software performs a Library search displaying Maltol as the #1 hit. Maltol is a naturally occuring organic compound primarily used as a sweetener and a flavor enhancer. 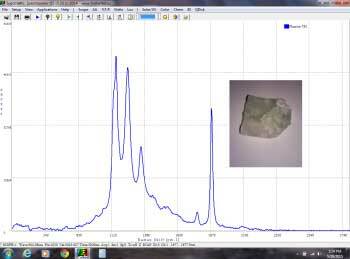 Raman spectroscopy is being used more and more in the analysis of rocks and minerals. Raman is very sensitive to end-member functional groups like -OH and -CO2 and is well suited for silicate and carbonate minerals. Raman can identify minerals that NIR or other techniques may be blind to and can even identify different forms of carbon. 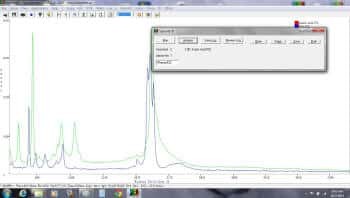 Sodium dihydrogen phosphate (NaH2PO4) and Disodium hydrogen phosphate (Na2HPO4) can be dissolved in water and distinguished by 785nm Raman spectroscopy. Raman Spectroscopy with a 532nm Raman spectrometer and laser is another popular option. Choose the Laboratory Laser 532, Raman-HR-TEC (or new Raman-HR-TEC-X2 upgrade), Raman-probe-532nm, Raman probe holder, and 532nm Laser Safety Goggles. 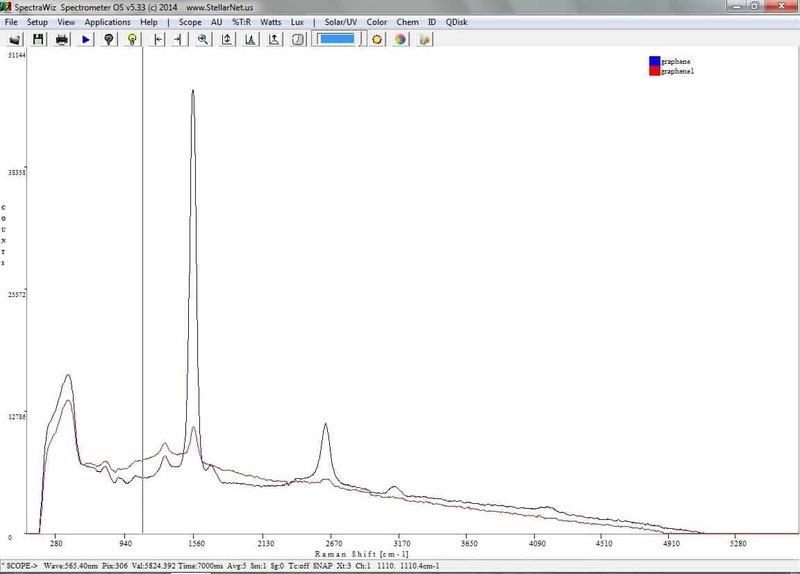 532nm Raman Spectra of Acetic Acid using StellarNet Raman-HR-TEC (configured for 532nm lasers), Raman-Probe-532, and the Lab-LS-532. Additionally, probe holder and laser safety goggles are required with every system. 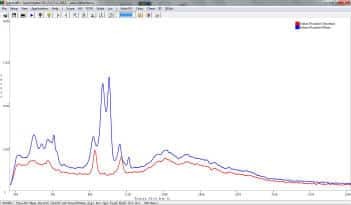 532nm Raman Spectra of Graphene & Graphite samples using StellarNet Raman-HR-TEC-X2 (configured for 532nm lasers), Raman-Probe-532, and the Lab-LS-532. Additionally, probe holder and laser safety goggles are required with every system..
Raman Spectroscopy with a 1064nm Raman spectrometer and laser is a popular system for reducing sample fluorescence. Choose the Ramulaser-1064nm, Raman-HR-TEC-IG, Raman-probe-1064nm, Raman probe holder, and 1064nm Laser Safety Goggles. 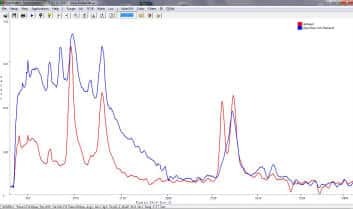 Raman spectra of Rum with methanol spike using the Raman- Probe-1064, Ramulaser-1064, and Raman-SR-TEC-IG spectrometer. The probe is held directly up to the side of the Rum bottle. Comparison with pure methanol shows similar peaks and means for detection. Raman Probe Holder Block RPH4 Supports 1/2? vials and solids like tablets and pills! Raman probe telescoping accessory increases working distance to sample! Raman-HR-TEC Raman High Resolution for 200-2750 cm-1 @ 785nm with 4 cm-1 resolution plus additional Thermo Electric Cooler (TEC) for increased S/N with detector integration times > 3 seconds. 1-stage TEC maintains -15 degrees and reduces noise by 50%. Raman-SR-TEC-IG Raman Standard Resolution for 200-2250 cm-1 @ 1064nm with 22 cm-1 resolution via PDA with TEC cooled 512 pixel InGaAs photodiode array. Minimize fluorescence via1064nm laser! Raman-HR-TEC-IG Raman High Resolution for 200-2250cm-1 @ 1064nm with 11 cm-1 resolution via PDA with TEC cooled 1024 pixel InGaAs photodiode array. Minimize fluorescence via1064nm laser! RamuLaser-785 Portable Raman Laser for 785nm with 350/499mW adjustable output and FC/APC attachment for standard Raman probe. Includes integrated LI battery with charger for 8 hour operation. RamuLaser-1064 Portable Raman Laser for 1064nm with 350/499mW adjustable output and FC/APC attachment for standard Raman probe. Includes integrated LI battery with charger for 8 hour operation. RamuLaser-Vial Portable Raman laser vial for 785nm, 500mW adjustable output power, 0.2nm FWHM laser with integrated collection optics for direct attach to spectrometer! Reduces System cost! Raman- Probe-785 Attaches to laser via FC/APC and spectrometer via SMA 905, has integrated Raman filters and optics with working distance of 4.5mm to sample, configured for a 785nm laser. 105um illumination fiber and 600um collection for highest sensitivity. 7.5mm, 10mm, and larger working distance optional. Raman- Probe-532 Attaches to laser via FC/APC and spectrometer via SMA 905, has integrated Raman filters and optics with working distance of 4.5mm to sample, configured for a 532nm laser. 105um illumination fiber and 600um collection for highest sensitivity. 7.5mm, 10mm, and larger working distance optional. 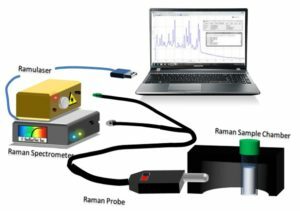 Raman- Probe-1064 Attaches to laser via FC/APC and spectrometer via SMA 905, has integrated Raman filters and optics with working distance of 4.5mm to sample, configured for 785nm laser. 105um illumination fiber and 600um collection for highest sensitivity. 7.5mm, 10mm, and larger working distance optional. RPH4 Raman Probe Holder Block for the Raman- Probe-785. Accepts cuvettes and solid samples. RPH5 Vertical Raman Probe Holder Block. Samples are placed onto a slide and inserted into the measurement chamber of the block. Includes a laser safety interlock and base.